The Society for Underwater Technology (SUT) has today launched a quirky, illustrated book for 10 – 14 year olds aimed at growing interest in the exciting variety of careers on offer under the waves. The book titled, Can a Lobster be an Archaeologist – Quirky Questions and Fascinating Facts about the Underwater World, is available from Wednesday 25th November with all proceeds going to SUT’s Educational Support Fund, set up to help young people pursue learning and development opportunities. The book takes its name from a true story about Larry the lobster who helped divers discover a missing 8,000 year old Stone Age civilisation near the Isle of Wight. The 150 page book has been drafted by SUT members who are marine scientists, divers, subsea engineers, academics and from the merchant navy. The book has been funded by SUT, which will celebrate its 50th anniversary next year. Can a Lobster be an Archaeologist? retails at £12.99 and can be purchased from Wednesday 25th November from SUT www.sut.org/can-a-lobster-be-an-archaeologist/ and from Amazon www.amazon.co.uk from the end of the month. 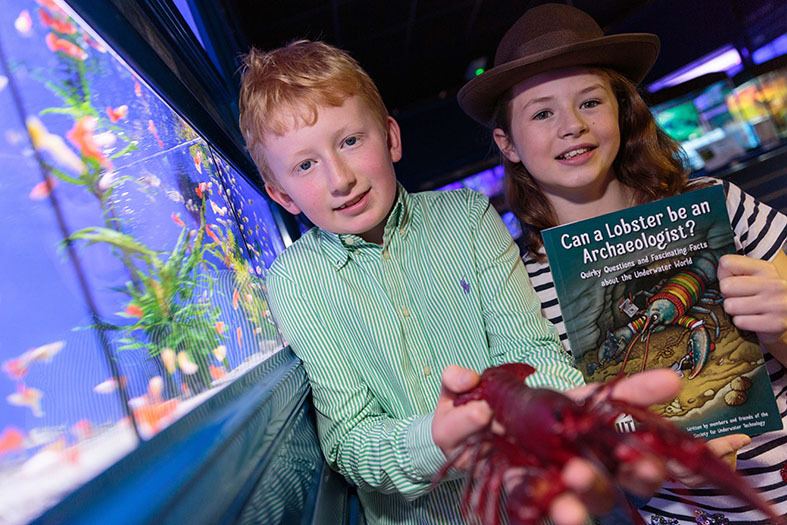 Image: David Laing (10) and Daisy Nicholls (10) of Aberdeen launch the new book Can a Lobster be an Archaeologist? All proceeds from sales will go to the Society for Underwater Technology’s Educational Support Fund.